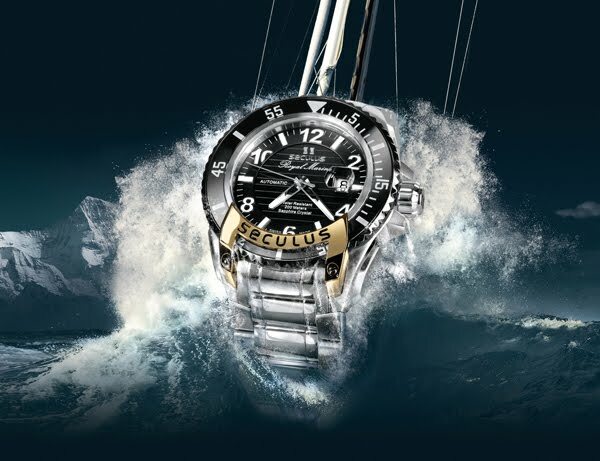 Resolutely sporty, daring and powerful with its water resistance to 200 metres, the Royal Marine by Seculus defies oceans and their depths. The 316L stainless steel case houses an ETA 2824 automatic movement, a token of reliability. The result is 48 mm of pure functionality: a three-hand dial and a date window at 3 o’clock, highlighted by a magnifying lens built into the sapphire crystal. Loyal to the rigorous standards and high performance demanded by Swiss watchmaking, the Royal Marine watch is a tribute to devotees of technology and style. Two engraved plates with or without gold plating – one between the lower horns and the other on the left-hand side of the case – proclaim its kinship with the name of both the brand and the model. This finely crafted and virile timepiece is fitted with a sporty triple-link steel bracelet or a silicon strap with diving extension.